After attending the premiere Penelope tried to cut her head off with a giant scissors. Let’s face it, nobody really expected Disney to pull off a movie based on a theme park ride. So when they smashed the box office in 2003 with Pirates of the Caribbean: Curse of the Black Pearl and launched Johnny Depp onto the Hollywood A-list, most of us were treated to a helping of humble pie with our big glass of pirate-y rum. But jump ahead to 2007 and, two sequels later, the series had gone from sailing smoothly to treading water. The Pirates Trilogy wrapped up nicely and that was the end of that. Until it wasn’t. Amidst all the hype of the final Harry Potter and the veritable superhero smorgasbord, Disney needed something nice, safe and recession-proof. Time to dust off the three cornered hat and put Jack back on the high seas. You’ll wish they hadn’t. On Stranger Tides follows Jack in his hunt for the fountain of youth. You may remember that at the end of the third installment he escaped with the map detailing its location, but that all becomes irrelevant quite quickly because, within 15 minutes of the movie starting, half of Europe knows where it is and about the all magical ritual required. From that point on the movie plays out like an adaptation of a videogame with several “Get the Thing” set pieces, divided neatly into levels for the convenience of the good folks over at Disney Interactive Studios. The rival factions have to collect a bunch of different things to gain access to the Fountain of Youth, but none of them has an interesting reason for wanting to find it, and Jack himself has no reason at all. Johnny watches playback of the dailies. The story is formulaic and overlong, and generally feels like a bunch of sequences that seemed like good ideas were cobbled together with a paper-thin plot. Motivation is scarce and the new characters are dangerously under-developed. Cruz’s Angelica could have been excellent, but instead of being strong and intrepid she comes off as wimpy and insipid. Sam Claflin’s missionary Philip could also have been explored and fleshed out, but instead he’s a plot device that takes its shirt off. Ian McShane could have had a bit of fun with Blackbeard but instead of playing it for moustache twirling villainy he goes for deadpan and is unremarkable. 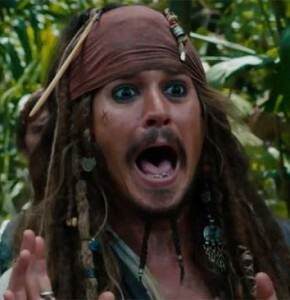 All the while Depp blunders around parodying his own character, who seems to have had a funny-bone-ectomy. The film has one standout sequence, the White Cap Bay set piece. Unfortunately for the tykes in the audience, it’s utterly terrifying and will more than likely result in nightmares and thalassophobia. That and a particularly unpleasant bit of flesh-stripping make this one your tiny tots won’t forget quickly. Funnily enough, it was not these sequences but rather “sensuality and innuendo” that earned the film its PG-13 rating, which we all know is the censor’s subtle way of saying that Penelope Cruz is very distracting. Overall the film is a poor attempt to pry an ailing franchise out of the clammy hands of Davy Jones. But have no fear, with the sequel set up at the end of the movie we’re sure that Disney haven’t flogged this horse quite enough. If you believe Johnny Depp can do no wrong, go see this movie. If you think ogling Penelope Cruz for 2 hours will keep you interested, go see this movie. If you thought the third movie was bad, go see Thor again. If you see it and like it, please drop me (Ian) an email and we’ll have a chat. A long chat.